The Gefen EXT-DVI-2500HD is a dual link DVI extender which uses 4 strand fiber optic cables to extend Dual Link DVI display up to 6,600 feet away from your source. Dual link DVI describes the use of all 24 pins of the DVI (Digital Visual Interface) connector to achieve super high resolutions. Featuring Virtual DDC, the DVI 2500HD can run without the use of a CAT5 cable. The DVI-2500HD Sender unit sits next to your computer. Cables supplied with the DVI-2500HD system connect the DVI source to the DVI-2500HD Sender unit. The DVI-2500HD Receiver unit sits next to your Dual Link DVI display and plugs into the DVI display's dual-link DVI port. 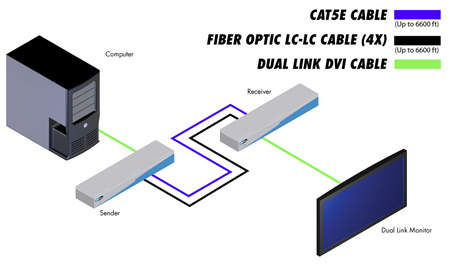 An optional CAT-5 cable and multi-mode 4 strand LC fiber optic cable (4-strand) connects the sender and the receiver units to each other. Note: The CAT5 cable is for direct DDC2B, Hot-plug and DC power. With two 2 strands, single link DVI is able to be transmitted long distance as far as 2Km under WUXGA (1,920x1,200). Dual link DVI is able to be transmitted long distance as far as 2Km under WQXGA (2,560x1,600). Extension can be up to 6,600 feet (2 km) with Virtual DDC and single mode fiber and up to 330 feet (100 m) with DDC2B. Supports up to 2560 x 1600 resolution at 60Hz refresh rate.